The line-up before the Ponteland Rugby Club Golf Classic started. The 27th annual Ponteland Rugby Club Golf Classic attracted a line-up of 70 current and former players, members and guests, at Seahouses. The seaside course has been a fixture for nearly three decades and a popular event in the club calendar. Organiser Andy Maidwell said: “Once again it was a great opportunity for everyone to get together for a wonderful day out. “We are well looked after by everyone at the golf club, and although the golf may not be the highest standard, we certainly enjoy ourselves. “The event has evolved over the years and this time it was good to see a lot of rugby players who were there at the start of the golf classic coming back with their sons to add to the vibrancy of the occasion. Play stopped at noon to observe the national one-minute’s silence to remember the victims in Tunisia. 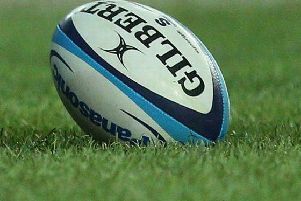 Ponteland Rugby Club continues to have success on and off the field. They have been promoted to Durham and Northumberland Division 1, held the second annual beer festival at the end of last season, and on October 3 they have linked-up with the Diamond Inn for a Rugby World Cup day. It includes a marquee, barbecue and large screen showing Samoa v Japan, South Africa v Scotland and England v Australia.